Dear Bookworms when we said these lines we meant to say what the authors of Myriad Tales did, some of them are new and some have old habits in writing but they all are trying to achieve their dreams but living and enjoying the present moment, writing isn't about winning a competition and getting published, it means letting your inner emotions get out of your consciousness and poured into eternal sheets of Time. Book launch on the 19th of Oct 3pm to 5pm in Chemould Art Gallery in Art Fair III where art meets appreciators. When he realized that he wasn’t made out for a corporate job, Ritesh Agarwal quit CA and took up writing as a full-time profession. In 2013, he got something off his bucket list when he got published in ‘Lovelets’, an anthology of love stories and poems. Later, his poem "Death of a Soul" got published in the anthology 'Confessions of a Heart'. On personal front, he also relishes teaching, taking amateurish photographs with his over-expensive camera and eating tomatoes at midnight. Q1: Tell us something about your story,how did you chance upon the contest? A: I had written this story called “The Lady who loved tea too much” a few weeks prior to I chanced upon the contest. It is about an elderly widow whose only worldly attachment is her tea. The story came as a flash of inspiration and is loosely based on my mother and my maasi who are equally obsessed with the beverage. The contest was being propagated on Facebook and having common friends amongst bloggers, I ran into it and thought of submitting this story though I wasn’t sure if it would fit any of the genres. But they somehow placed it under the ‘horror’ category and even though it does have a supernatural element, it is more of a drama than a horror story. A: It was good to win the contest though there is nothing to be too proud of as there are several other authors who will share the platform with me. The only satisfying thing is that this is my personal favorite story and it would have really pained me had it got rejected. Without being pompous, let us say that it will be hard for any reader not to fall in love with this tale. This will be my third book. Before that, I have got published in ‘Lovelets’ and ‘Confessions of a Heart’. However, this will be my first full-length short story since the previous ones were either flash fictions or poems. Also, they were okay-ish in quality. I don’t take much pride in those works. Q3: Do you think anthology is a good opportunity for young authors to try their hand in the skill of writing? A: It is, since an anthology gives a young author an opportunity to get published, find readers who will either like your work which is good or will hate your work which is even better as it enables you to improvise. A: As such, a story can have multiple genres. Like I said before, my story ‘The lady who loved tea too much’ straddles the disparate genres of drama, horror and romance. Also, I feel that the writing style and flow are more important than the plot because if you don’t have a good flow in your writing, the plot will be of little use. A: A lot depends on your state of mind. Sometimes, I just run into a powerful phrase and decide to write a story based on that. At times, the seed of a plot takes birth in the mind and then I try to take it forward. For short stories, I usually try to capture a flow and then the story develops extemporaneously. In romance and horror (which are my preferred genres), the plots are superfluous. What matters is how you write rather than what you write. 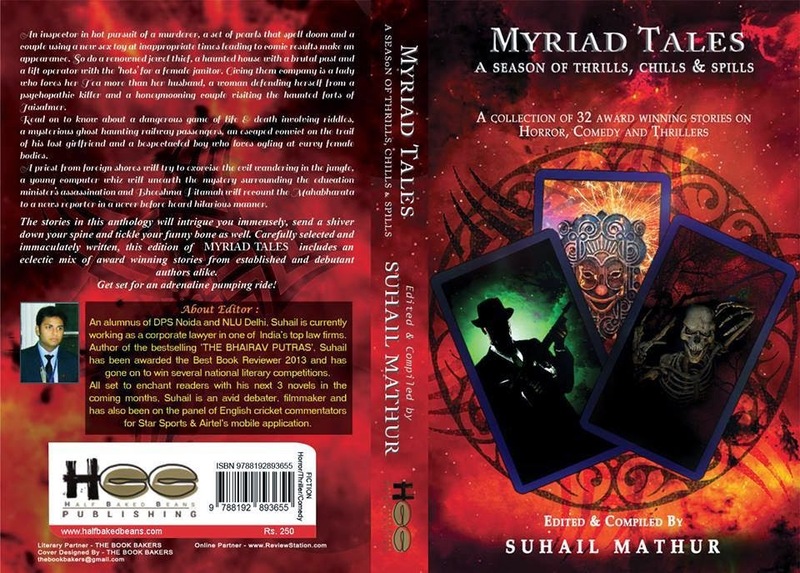 Q6: What do you have to say about the Myraid tales team Suhail,Chetan and Himani? A: As professionals, they are quick and that is their biggest trait. This project got off the burner quickly and the team did a laudable job in interacting with authors and helping everyone feel belonged. A: There is a message inserted in the book. As far as a fan following is concerned, I do not have any. I am a nobody at the moment. A: I was a commerce student and half-way down CA, I quit it because I wasn’t enjoying it. There wasn’t this ‘kick’ in it in the words of Salman Khan. Reading has always been my favorite pastime and even during my high school days, I would sketch out odd little stories for the school magazine. You can say writing just happened. In fact, my whole life is based on serendipitous events. A: Creative satisfaction, a sense of liberty and more importantly the power behind the pen. Those who are career-oriented or money-minded generally never plan to become a writer. But those who have a fascination for books and consider money as secondary find this field as a soulful repose in this odyssey called life. Q10) How good has been participating in anthologies? Recently we have seen many traditional and self publishing anthologies coming up through competitions so how efficient are they, anything that you have experienced that can suggestions. A: Participating is good for one’s competitive streak and winning seems like bliss. But of late, there has been a drop in quality for which the judges and publishers are equally responsible. The small-time publishers often play to the gallery and this has lowered the standard of contemporary anthologies. There has to be greater emphasis on quality check. Q11) How has been the response from your friends? A: Friends being friends will always say that your work is good. So, I shouldn’t go on that. But they are supportive and their encouragement gives you the push to write. They can also help as we often find a short story lurking in their lives. Almost all my short stories are simply incidents borrowed from somebody’s life and rephrased in my language and colored up with my imagination. Q12) Do you think Being bookworms by supporting authors, books, and other literary events are creating a new opportunity for good authors to interact with their creative side and bring readers more closer to them. A: Yes, it is always a good thing. More so because the big publishers like Penguin, Harper Collins, RHI etc are unlikely to entertain you unless you have written something really incredible which is tough on young authors who have to shuffle between professional life and writing life.